Where should you buy a colored gemstone? Your desire to own or wear a colored gemstone isn't new or unique. Throughout all civilizations, gems have held a fascination-sometimes even a legendary power-for man. The mystery and romance of gemstones goes back as far as we can trace-to those primitive days when man coveted these beautiful stones as "charms" or amulets" to ward off evil. And later, as man became more sophisticated, the rarity and beauty of gems established them as the ultimate symbol of status to the rich and powerful. Today the pride of possessing a rare and beautiful gemstone is as great as ever. There is, however, one major difference. At one time, only the very wealthy-or the very powerful-could hope to own a gemstone. Today, thanks to discoveries of rich mining and alluvial sources, you no longer have to be a millionaire to own a gemstone. Most simply stated, the majority of gemstones are minerals. (Important exceptions: pearl and coral are animal origin; jet and amber are vegetable.) These minerals have been crystallized as a result of the high temperatures and pressures exerted by nature on the elements that form the earth's crust. Of the more than 3,000 minerals found on earth, only a small percentage qualify as "gemstones" due to their beauty, durability, color and rarity. The most sought after are transparent gems, drops of pure color cut from single crystals. These gems were once divided into precious and semi-precious categories, but this is no longer true today. Gem discoveries have added new varieties to the traditional selection of ruby, emerald and sapphire. 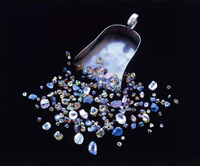 Some of these more unusual gemstones command higher prices than more well known gemstones due to their beauty and rarity. For example, fine jade and fine opal, tsavorite or alexandrite would be more valuable than lesser quality diamonds or emeralds. The selection of fine-quality gemstones includes such stones as alexandrite, amber, amethyst, aquamarine, chrysoberyl, citrine, garnet, iolite, jade, kunzite, lapis lazuli, moonstone, opal, peridot, sugilite, spinel, tanzanite, topaz, tourmaline, tsavorite, turquoise and zircon. Each of these gemstones has a particular charm, color and identity. Each person has his or her own reason for wanting to buy, own, or wear a colored gemstone. There are, however, several basic - and valid - reasons that make gemstones a desirable possession. Gemstones are primarily beautiful. Every stone is a natural work of art, each one having a distinct and separate personality possessing unique and distinguishing beauty marks. Gemstones are durable. Gemstones are capable of lasting for generations - even, in some cases - for centuries. The Treasures of King Tut prove that gemstones endure through many lifetimes. Gemstones are rare. While it is true that there are new sources of gemstones, today's economy has brought "expendable" income to more people than ever, and this affluent public shares the historic love of gemstones. Therefore, since the demand for gemstones is greater than ever, the supply is, in fact, limited in its ability to meet this demand. Gemstones retain value. Rubies, sapphires, emeralds and diamonds were treasured as portable wealth in times of war. In recent years, there has been such a widespread interest in all gemstones, and so many fine new specimens have been discovered, that the prices of all gemstones have risen dramatically. Gemstones are a way to store value while enjoying beautiful jewelry. Finer quality gemstones in smaller sizes will hold value better than a larger gemstone that is less fine because of the rarity of fine quality gemstones. Color - The strength and purity of a gemstone's color is of prime importance. There is no established "right" or "wrong" color, and there are literally thousands of shades of red, blue and green, for example. Therefore, you should make your selection according to your own personal taste. Cut - The cut of a gemstone is of extraordinary importance. The proper cutting emphasizes the richness of the gemstone's inherent color, which is the focal point of the gem's beauty that attracts the eye. Clarity - While the clarity of a gemstone is an important feature, it is equally important to remember that completely "flawless" gemstones scarcely occur. Inclusions are inherent to practically every gemstone and are nature's way of adding variety and individuality to a gemstone. Even the most expensive contain some inclusions. Carat Weight - Obviously, the size or weight of a gemstone also affects its value. Admiring and reading about gemstones may make you feel knowledgeable, but you're still not an expert. If you're thinking about purchasing a gemstone, you need a trained professional jeweler whom you can trust. He can counsel you on quality and advise you on the right type of setting and mounting. Your jeweler can recommend a setting that will best display your gemstone, allowing the right amount of light to reach the stone while still providing maximum protection. The right color mounting can add to the attractiveness of your gemstone. If you're using more than one gemstone in your mounting, you especially need professional advice. Buying a gemstone is your investment in lasting beauty. Treat it accordingly. A gemstone's durability makes it capable of lasting for generations - but it must be handled with care. Keep your jewelry separated when you put it away. Never let one item touch another, and always put it on soft fabric. Apply your colognes and toiletries before you put on your jewelry. Clean your jewelry regularly. Ask your jeweler to recommend the proper cleaning methods. Bring your gemstones to your jeweler every year. He can give them an expert cleaning, and also check that the stones are secure in their settings. Finally, rely on your jeweler - before and after your purchase. He's here today, not only to sell his merchandise to you - but, he'll also be here tomorrow, to give you service and advice.